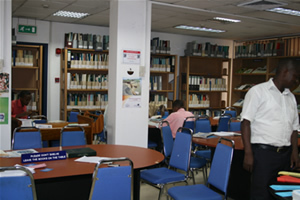 The NEMA Library was established in 1996 under the Division of Information and Monitoring. It inherited the bulk of its collection from The National Information Centre, which was under the then Ministry of Environment. 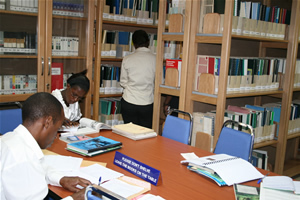 The Library's main purpose is to develop and maintain a collection of scientific and technical information on the state of environment both nationally and internationally, which information assists the staff of NEMA in analysing trends, assessing problems and promoting activities leading to sustainable development in the field of environment as well as making it available for research purposes. Atmosphere and climate, Terrestrial ecosystem, Forestry ecosystem, Arid land and desertification, Bio diversity, Protected areas, Water, wetlands, marine environment, Environment and development, Agriculture, Energy, Industry, Pollution and waste, Environmental law, Chemical and biochemical processes G I S and remote sensing Materials acquired by the Library are classified according to the INFOTERRA Thesaurus and are entered into the library database to ease retrieval. Periodical literature is organised according to the environmental subjects and are placed together with the corresponding subjects. Government publications are arranged according to titles. The Library embarked on expanding its readership through a program of setting up Environmental Information Resource Centres in 25 Districts in Uganda. This program has enabled the dissemination of environmental information to the grass root population to assist in the sustainable use of Uganda’s natural resources. The library has seen a steady growth in the number of users since its establishment from about 60 a month to almost 450 by the end of December 2009. This is attributed to the fact that environmental issues have gained a lot of importance in the past six years nationally and internationally. The library currently carries out Environmental Information Repackaging and this information is sent to NEMA partners and all those organisations on the mailing list to ensure that environmental information is widely disseminated. More information is now available in form of Newspaper Clippings from the Daily Newspapers as a way of capturing all available sources of environmental information. A Media room has been established for purposes of viewing the environmental videotapes and this service is available for the members of staff as well as the public. The Library opens at 8.00am to 12.30pm and from 2.00 to 4.00pm everyday except on weekends and public holidays. CONTACT ADDRESS National Environment Management Authority P.O.Box 22255, Kampala, Uganda Tel : 256-41-251064/5/8 ;Fax : 256-41-257521 Email : info@nemaug.org : emutongole@nemaug.org Website : http://www.nemaug.org.